My daughter Gracie recently picked out My AG number 47 at the Madison Children's Museum Benefit Sale, and I planned to give it to her for her August birthday. We thought that she looked like she was from India, and I hit eBay in search of the perfect dress for her. 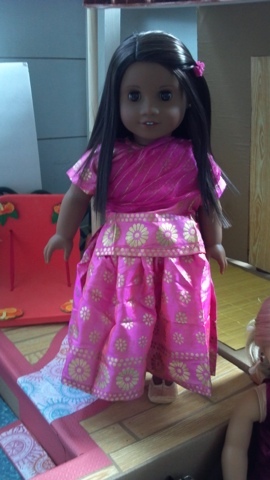 I found this beautiful costume for the doll, and discovered that the seller, Leah, also had the girl sized version! This is Salena (Indian name that means moon). 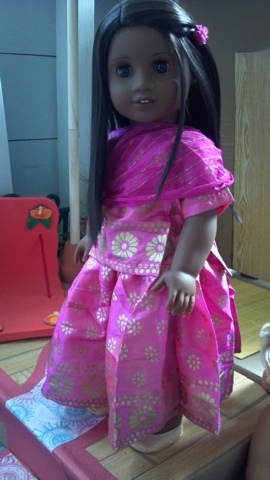 She is beautiful in her new outfit and looks like she is from India! 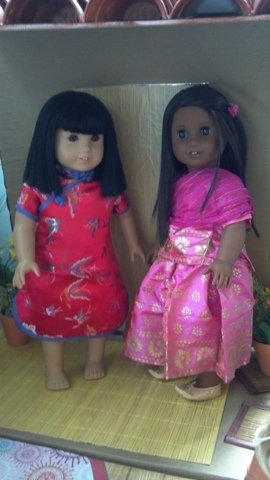 We are so excited to add ethnic variety to our doll family and doll play! The doll set came with a skirt, top, and scarf. The fabric is a silky iridescent pink with a gold medallion screen-printed pattern. I paired it with the shoes from the AG genie outfit. They look perfect with this dress! The girl dress was available in Medium and Large, and Leah was kind enough to measure the garment for me, so that I could be confident it would fit. My daughter is between size 12/14 with many 12's beginning to be too small, so I was concerned the Large might be too small. The skirt has an elastic waste and the size large was a perfect fit! Both outfits came new in a package, and tagged with the 'Little Bridges' brand. The fabric is so beautiful in person, pink and gold but with an iridescent sheen of orange over the entire outfit. The girl set came with the skirt, a top that Velcros down the entire back, the pink and gold wrap/scarf, a stack of matching bangle bracelets and a little pink and gold envelope with a page filled with stick on gems for her forehead. The girl dress set also came with a card with a photo of a girl from India and letter from her telling about life in that country. My daughter loved this little extra, and told me all about life in India. On the back of the card was a map of the world, highlighting where India is in the world. 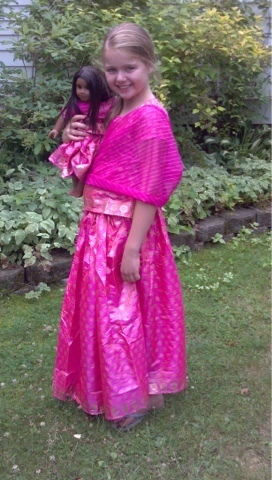 My daughter is going to wear this dress and be an Indian Princess for Halloween! 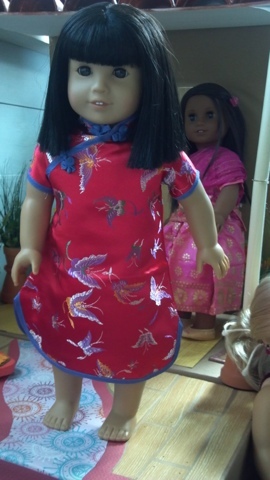 The same seller had this China dress for dolls and a matching girls dress too. I ordered both, but my younger daughter didn't want to cooperate for the photo! This dress ran smaller, so I also ordered a large for her, which will be great for Halloween when she needs to wear warm clothes under it. But, I think a medium would have fit. The doll dress snaps down the side and across the front so it is very easy for my daughter to get on and off the doll. 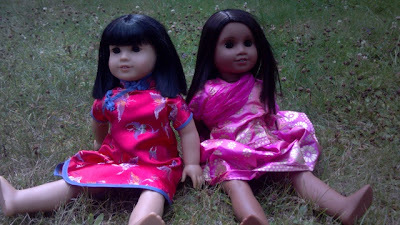 It looks great on Ivy, and I love that my daughter can dress like her doll and pretend she is from China too! The girl size dress came with a real Chinese fan, made out of carved wood! It also came with the Little Bridges card with a story from a little girl from China! I love these sets and couldn't be happier with the quality of these products! Although I did not purchase the Japanese style, this is a photo of the girl and doll sizes.The seller has multiple sets of each. I purchased the first Indian doll dress through eBay, then was sent an invoice through PayPal for the non- listed items I had inquired about. Leah can be reached through email at leahwheelan@yahoo.com. Leah is offering the doll dresses for $7 shipped to our readers, and 18$ if you are interested in all 3 doll sized dresses. The girl dresses are $15 which includes shipping as well. 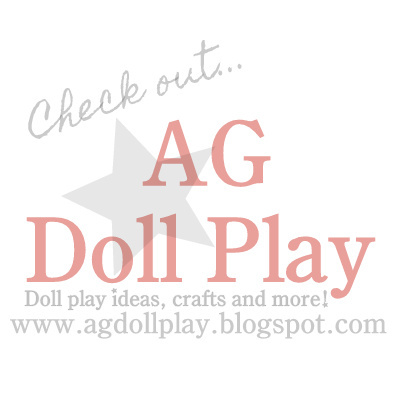 Please let her know that you heard about her from AG Doll Play if you decide to make a purchase! That is a great deal. What a great idea for halloween.